June 1, 1982- Robotron 2084 was released to the public! To commemorate the 30th anniversary of this classic game on the historic 30th birthday, June 1, 2012. The official release date you see at the IGN site listing June 1, 1982 is 100% accurate per Williams. The date of March 12, 1982 listed as the commerce date, reflects the field testing phase, not production release. Trademark registration was filed April 8, 1982, registered June 7, 1983, renewed Feb. 11, 2004, and set to expire June 7, 2013. I want to celebrate 30th anniversary of ROBOTRON from JAPAN! Happy birthday!! From the first play in 1982 I was hooked to the crazy tension of this game! Even in 30 years, I’m still playing ROBOTRON time to time and also find new ROBOTRON players from twitter friends, some are even born after ROBOTRON! 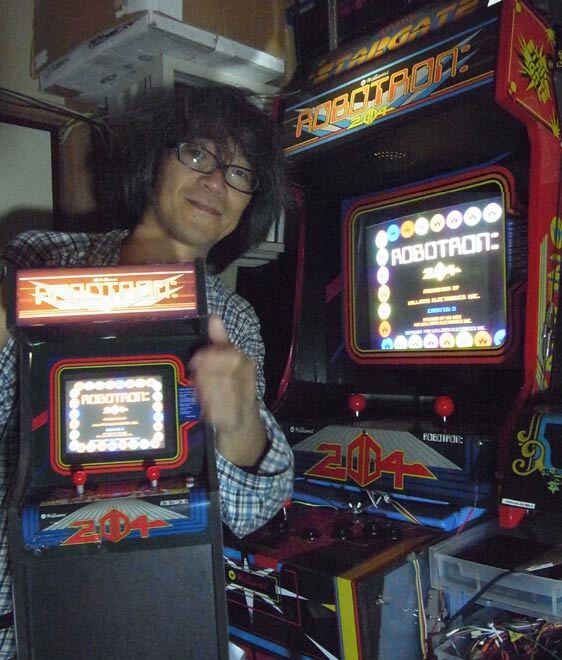 Included pic is around 2 years ago I made my tiny ROBOTRON cabinet and last year I made combo cabinet of ROBOTRON with another great game STARGATE. They are dreams come true playing dedicated machine in the home. I hope everyone, new comers still playing this game and going crazy! Also hope for ROBOTRON II !!!!! !